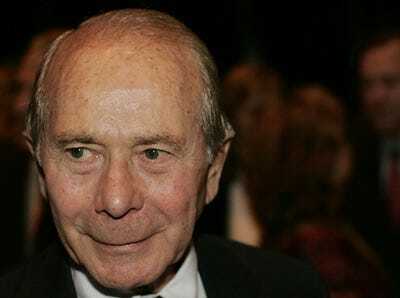 NEW YORK (AP) — Former American International Group Inc. CEO Maurice “Hank” Greenberg is selling the shares he still owns of the insurer to UBS Securities LLC for $278 million. Starr International, which Greenberg owns, will sell 10 million shares of AIG stock to UBS in four blocks of 2.5 million shares, according to a filing submitted to the Securities and Exchange Commission. UBS will pay for the shares upfront. The contract allows Greenberg to cut his exposure to the up-and-down stock, while holding onto some of the potential upside should shares climb. The deal calls for Greenberg to transfer the last 2.5 million shares to UBS in May 2013. Depending on the price of AIG shares in the days before the transfers, Greenberg could receive an even larger payout. His exposure to losses are limited if the stock drops because of the initial sale price. Shares of AIG fell $1.47, or 4.2 per cent, to $33.33 in midday trading Monday. AIG shares have been extremely volatile in recent months as the insurer tries to restructure its operations and sell assets to help repay government bailout loans. Shares have traded between $8.22 and $55.90 during the past year. AIG, based in New York, was first bailed out by the government in September 2008 and eventually received an aid package worth more than $180 billion. The government received an 80 per cent stake in the company. Earlier this month, AIG sold two large foreign insurance units in its biggest sales since its government rescue. The roughly $50 billion raised from the sale of American Life Insurance Co. and AIA Group is being used to cut government debt.